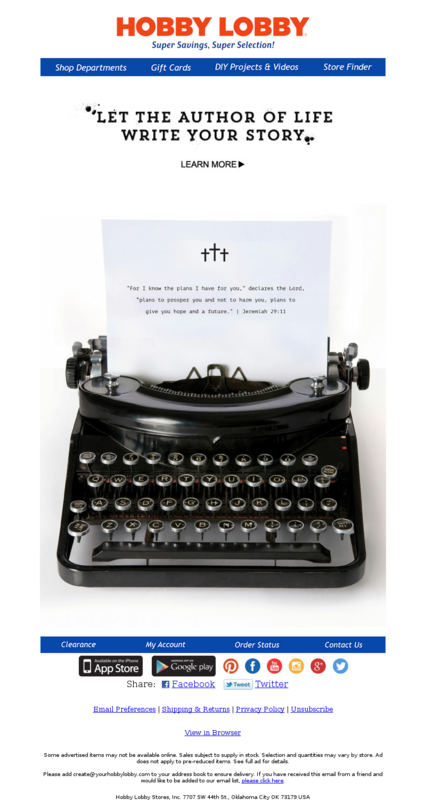 Below you’ll find the canonical reference for Easter email planning. From email examples to specific promotional strategies, we’ve included everything you need to ace your campaign. This email does three things well: 1. It uses a fun egg-hunt theme to entice shoppers into clicking all over the website to find polishes on sale. 2. It combines a cute graphic with an up-close-and-personal animated GIF showing different nail polishes, which is what varnish fans really want to see. 3. By promoting the hunt over the usual discounts this email stays fresh days after Easter – longer than that overlooked Easter egg hiding under your sofa. This email, sent a month ahead of Easter, appeals to shoppers who are still browsing but have Easter on their minds. The editorial content strikes the right balance between education and promotion. The prompt at the end (“Explore Hostess Gifts”) is an often-overlooked opportunity. Try adding it to your own promotional emails. 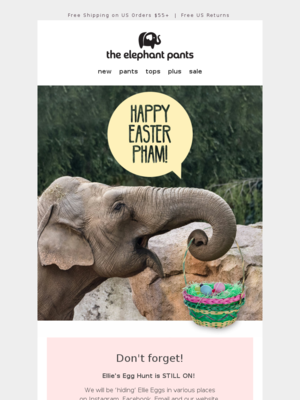 Sure, this email personalizes the subject line (“Happy Easter Pham!”). But we like that the brand also personalizes the graphic inside the email, which arguably is even more attention-getting than the subject line. We also like the little animation at the bottom of the email, which catches the eye and moves it down to the 3 product offer buttons below it. Easter is both a religious holiday and a secular one. 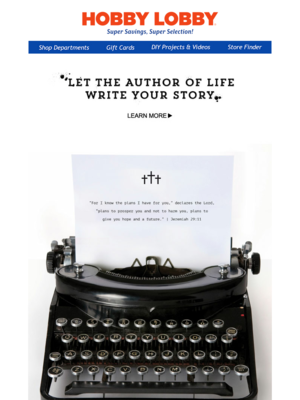 Hobby Lobby, allied with conservative Christianity, walks the fine line between the two with this simple and thought-provoking email. It's not preachy, and only the three crosses hint at the Easter connection. (Easter isn't even mentioned except in the subject line: “Our Easter Message …”) Yet the email is all the more affecting and memorable because it steers clear of the usual Easter sentimentality. 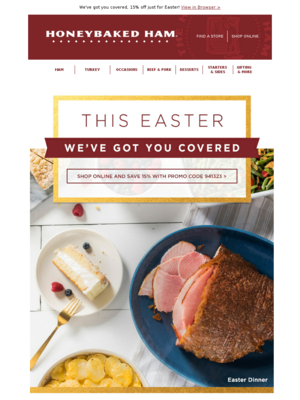 Family is also the focus in this email from Honeybaked Ham, but the appeal isn’t just the hero image of that enticing Easter dinner. The copy both reassures – “This Easter We’ve Got You Covered” – and suggests urgency with the countdown timer for the order deadline. 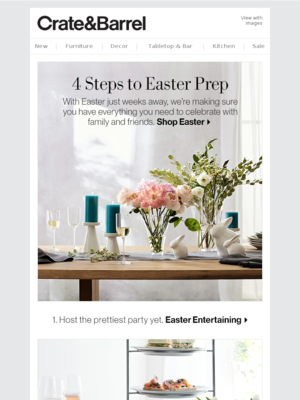 Start planning your Easter email strategy with great examples. This Pottery Barn email calendar is based on Pottery Barn, who sent 19 emails for Easter in 2018. This Converse email calendar is based on Converse, who sent 3 emails for Easter in 2018. This Burlington email calendar is based on Burlington, who sent 6 emails for Easter in 2018. 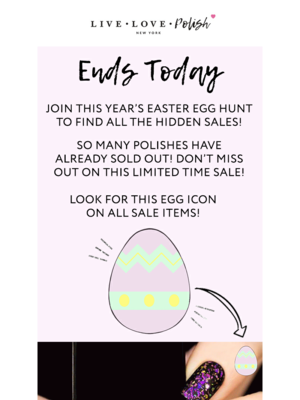 Will you simply send one email on Easter or will you send a few emails leading up to it, including a “last chance” email once the event is over? Based on 2285 emails mentioning "easter", "egg hunt" in the subject line. Discover the most popular types of promotions used for Easter. Understand how steep a discount companies offer for Easter. You can toggle between Dollars Off and Percent Off. Ace your Easter email content with these ready-to-implement strategies. Enjoy! Easter is one of the biggest consumer holidays of the year as well as a major worldwide religious holiday. In the United States, it’s No. 5 on the National Retail Federation’s Top 10 holiday list, after Christmas/winter holidays, back-to-school/college and Mother’s Day but ahead of Valentine’s Day, Father’s Day, and Halloween. A couple of Easter baskets, some candy, a couple new outfits and maybe a trip to the Easter buffet at a local restaurant … it all adds up to about $18.2 billion in spending. The NRF projected consumers would spend an average $150, down slightly from $152 in 2017. 82% of consumers planned to observe the holiday. Online is taking a slightly larger share of the market at 28% (27% in 2017). Most shoppers hunt for candy (89%), but food ($5.7 billion) and clothing ($3.2 billion) claim the largest dollar shares. Even if your business doesn’t have an obvious Easter spin, you should still send a holiday email to capitalize on the moment. Below are a few strategies you can leverage. Culturally, Easter is closer to Thanksgiving than Christmas, because all the travel, meals, and family togetherness happen in a few days, not spread over weeks before and after the actual holiday. Try reworking a successful Thanksgiving campaign with products and a motif that’s fit for Easter if you need to come up with a last-minute plan. Easter marks a major home and wardrobe refresh. Dressing up for Easter comes at the same time as many fashion retailers are launching their spring lines. People want to cast off their heavy winter clothes and lighten up the mood in their homes. Your warm-fuzzy message will earn you a smile—and maybe even some conversions. Every other retailer will be sending your customers emails that have endless variations on Easter-themed wordplay, like using “hop to it” or substituting “egg” or “eggs” for “ex” (“egg-citing,” “eggs-tra,” “eggs-treme”). That takes the punch out of your pun. InfoScout research shows 43% of Easter shoppers are in stores or browsing online 3 to 10 days or more before Easter, while 51% start shopping a couple of days ahead and 5% are shopping on Easter Day itself. Easter-week offers will find a motivated audience but could get lost in the last-minute heavy volume. Sending Easter content earlier in the mailing cycle can help your emails stand out better. People who aren’t ready to purchase at that moment will save your emails until it’s time to shop.